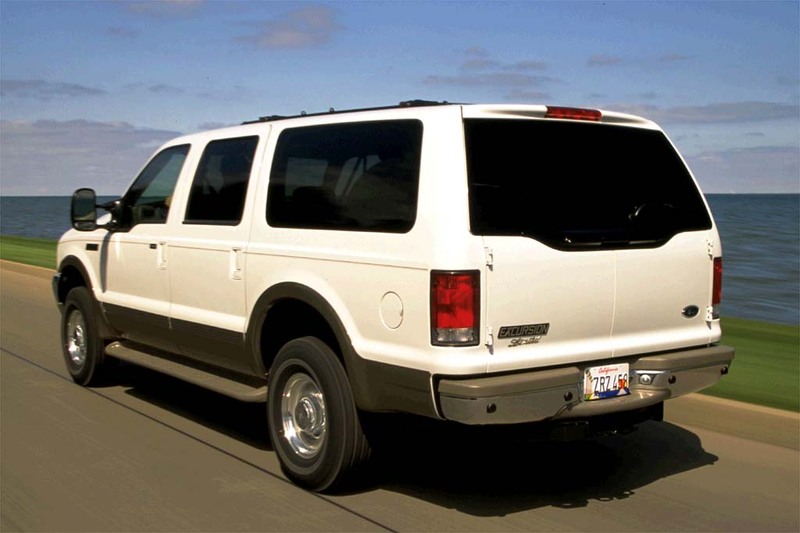 Massive size and weight are serious drawbacks for anything intended to be used as a “suburban utility vehicle.” The Excursion is simply too cumbersome for ordinary driving, suffering abysmal fuel economy as well as impaired mobility. Towing capacity and four-wheel drive are the positive points. Somebody always has to be the biggest. 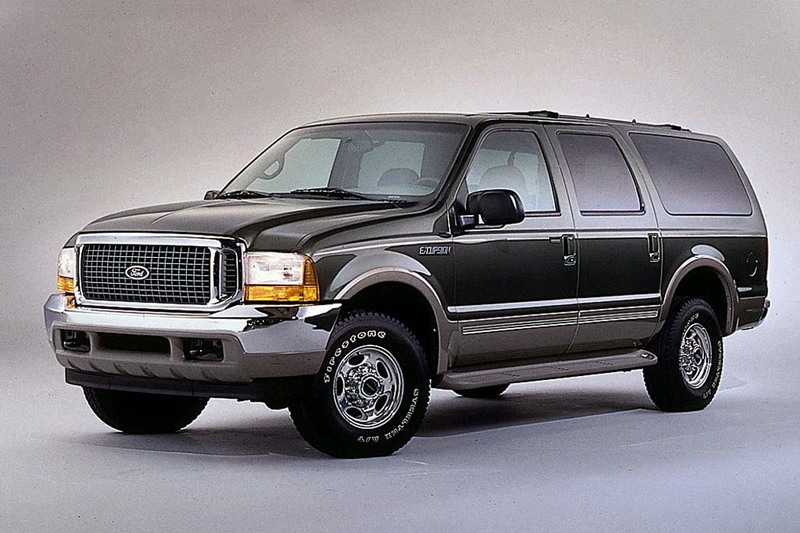 In the case of full-size sport utility vehicles, Ford took that prize with the introduction of the Excursion. The world’s largest and heaviest SUV, it was 7.4 inches longer than the Chevrolet Suburban, on a wheelbase 7 inches longer, and 6 inches taller. The Excursion also was some 1,900 pounds heavier, tipping the scales at more than 7,000 pounds. Critics from the environmental and safety camps were quick to take aim at the Excursion as an example of wretched automotive excess and waste. 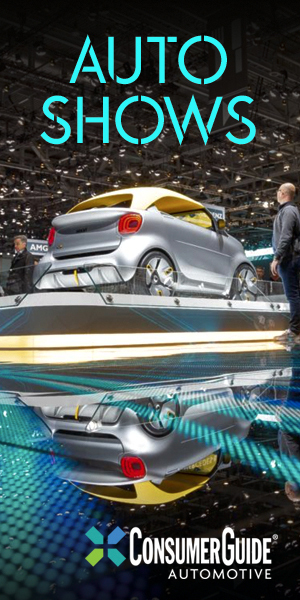 Ford responded by noting that all three available engines ranked as LEV (low emission vehicle), and that the Excursion made extensive use of recycled materials. In addition, a new BlockerBeam was installed. This was a steel crossmember below the front bumper, designed to prevent a passenger car from sliding under the Excursion in a crash. Based on Ford’s 3/4-ton F-Series pickup trucks, the Excursion came in XLT and Limited trim, with either rear-wheel or four-wheel drive. The body had four side doors as well as center-opening rear half-doors below a one-piece, top-hinged tailgate window. 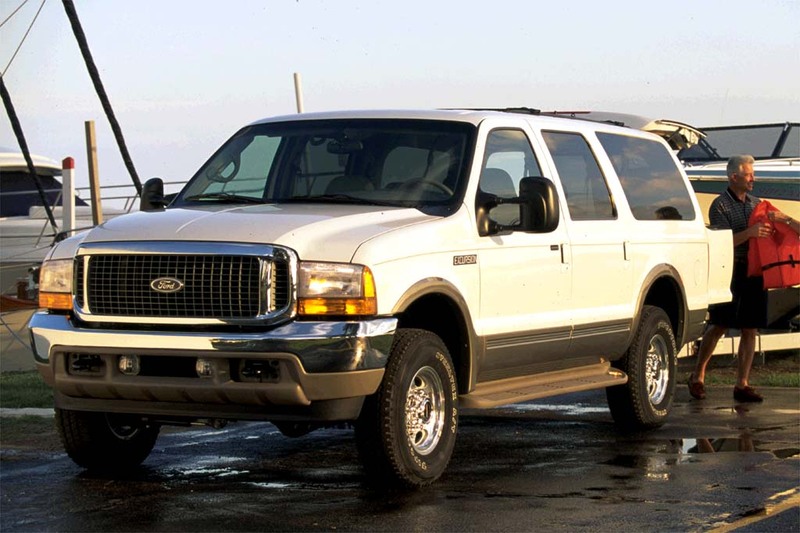 Seating as many as nine occupants, the Excursion competed against the Chevrolet Tahoe and Suburban, and GMC’s Yukon/Yukon XL/Denali–all of which had seemed quite large until Ford set a new dimensional peak. Base engine was a 5.4-liter V8. A V10 was standard with four-wheel drive, and optional with two-wheel drive. Ford’s turbodiesel V8 also was available. 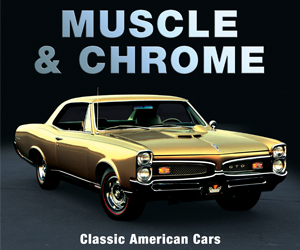 All engines drove a four-speed automatic transmission. The four-wheel-drive system shifted between 2WD and 4-High or 4-Low via a dashboard switch, but was not intended for use on dry pavement. 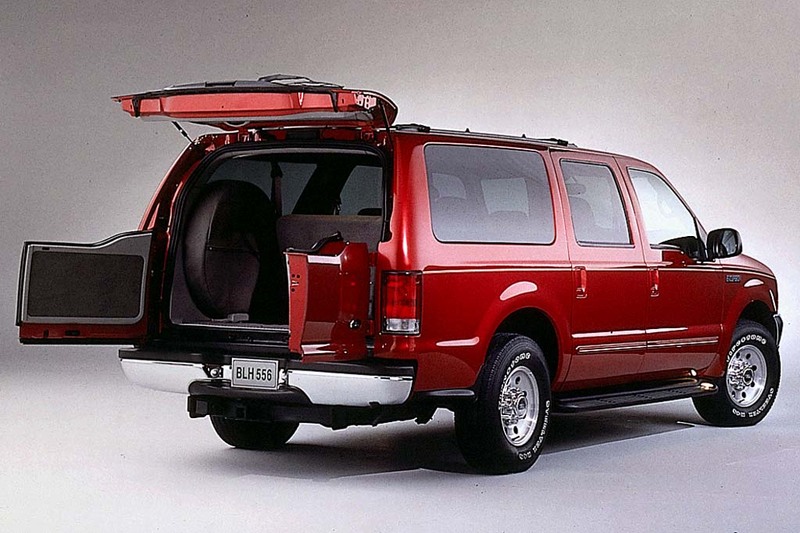 Ford’s smaller but full-size Expeditions, and GM rivals, had 4WD systems that could function on dry surfaces. Antilock braking was standard, but side-impact airbags were not available. An optional reverse-sensing system warned of objects in the Excursion’s path while backing up. Front bucket seats were standard in the Limited, and available in the XLT to replace its three-place bench. Both versions had a fold-down second-row bench and a removable third-row bench. Leather upholstery was standard in the Limited, optional in the XLT. For 2001, the turbodiesel engine gained 15 horsepower. Foglamps became standard on the Limited, along with mirrors that contained built-in turn signals. Power-adjustable brake and throttle pedals were optional on XLT and XLT Premium Excursions, and standard on the Limited and Limited Ultimate. On the Ultimate, they came with a seat/pedal memory feature. An optional rear-seat video entertainment system included a VCR and wireless headphones, with a DVD system expected later in the model year. An in-dash six-CD changer also was optional. When properly equipped, Excursions could tow as much as 11,000 pounds. No significant changes were made for 2004. The largest SUV sold in America got minor cosmetic changes for 2005. At introduction the base engine was Ford’s 5.4-liter V8. Optional was a V10 that made an impressive 425 pounds-feet of torque. Also available was a 7.4-liter turbodiesel V8. All mated to 4-speed automatic transmissions. In mid-2003 Ford switched to a new smaller, but more powerful diesel. It displaced 6.0-liters but made 325 horsepower and 550 pounds-feet of torque. It mated to a new 5-speed manual. Both the V10 engine and the turbodiesel get this heavyweight up to cruising speed fairly quickly. Passing power is impressive, aided by smooth, prompt downshifts. A 2WD V10 Limited averaged 10.8 mpg–one of the lowest figures we’ve recorded. A stable straight-line cruiser, the Excursion easily soaks up most broken pavement, but bigger bumps register rather sharply. Though not really ponderous in normal driving, steering is rather light but slow-responding. Curb-to-curb turning diameter is almost 50 feet, so swinging into a driveway or parking lot can be a chore. Stopping power feels strong and brakes are easily modulated, but stopping distances are long. Wind rush and road roar are suppressed quite well. The diesel idles noisily but cruises without fuss. Eight adults fit without painful squeezing. Second-row passengers enjoy exceptional leg room. The driver’s seat is comfortable, but a wide transmission tunnel intrudes somewhat into the front passenger’s footwell. Even with all seats in place, cargo volume is a class-leading 48 cubic feet. The one-piece third-row bench folds nearly flat and can be removed, though it’s heavy and cumbersome. Gauges are easy to see. 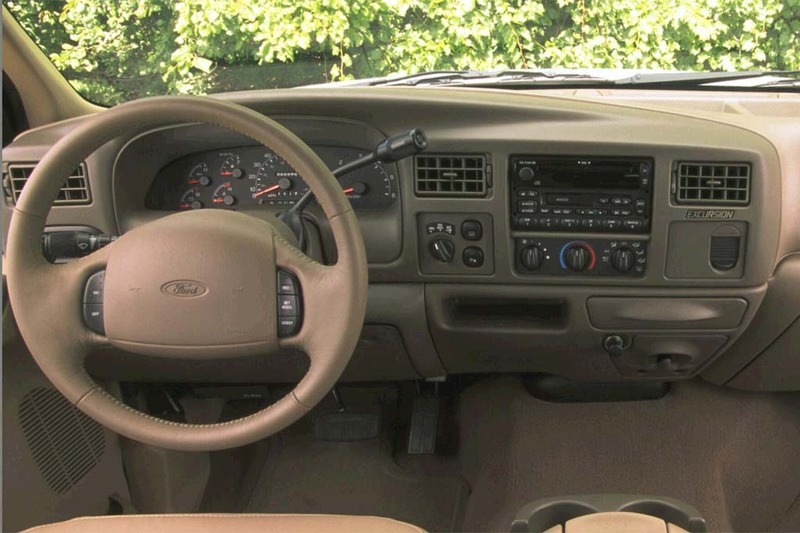 Controls are well within the driver’s reach, though the steering wheel partially conceals the 4WD switch. Forward visibility is fine, but a smaller vehicle can hide along the Excursion’s tall flanks, demanding caution. Four-wheel-drive models ride three inches higher than 2WD Excursions, but entry/exit isn’t bad. Running boards provide a useful foothold, rear doors are long, and clearance to the back seat is adequate. Description: The camshaft position sensor may function intermittently, causing the engine to stall. Dealers will inspect the sensor and replace it with an improved camshaft position sensor. Description: Headlamp switch knob can fracture and separate from the switch, making it difficult to activate the headlamps. Description: Wiper function may be lost due to a switch malfunction. Description: The speed control deactivation switch may overheat and possibly cause a fire. Dealers will install a fused wiring harness into the speed control system free of charge. Description: Airbag inflator canister may not be welded to standard and could keep the airbag from deploying as intended. Description: Driver- or passenger-outboard seatbelt may not fully latch. Description: The multi-function switch was shipped with a subcomponent (slider) that may experience deformation. A multi-function switch with a deformed slider may malfunction causing the turn signal, tail lights, hazard warning signal flashers and/or brake lights not to activate. Non-functioning lights could increase the risk of a crash. Dealers will replace the switches free of charge. Description: Engine ground stud that attaches negative battery terminal to engine block may be loose, which can cause radio suppression strap to heat and potentially melt. Description: Engine may stall without warning while driving, and may or may not restart. Captain’s chairs, 6-way power driver seat, trip computer, power rear quarter windows, illuminated running boards, bodyside stripes. NA with Special Services Group. Front bench seat, vinyl floor covering, manual outside mirrors, argent steel wheels. Deletes rear air conditioning, overhead console, automatic day/night rearview mirror, third row seat, cargo net, carpeting, floormats, bodyside moldings, roof rack cross members, wheel covers. Requires 6.8- or 7.3-liter engine. Requires Comfort and Convenience Group. XLT requires Comfort and Convenience Group. Requires optional tires. NA with Special Services Group. Captain’s chairs, 6-way power driver seat, trip computer, power rear quarter windows, illuminated running boards, bodyside stripes. Removeable cargo cover/mat, black monochromatic exterior treatment, unique headlights, chrome accents. Videocassette player, fold-down color monitor, 2 wireless headphones. Two-tone leather upholstery, unique woodgrain interior trim, cargo mat, unique grille, two-tone exterior. Std. 4WD w/5.4-liter V8 engine. DVD player, fold-down color monitor, 2 wireless headphones. Available in Alaska, Minn., Mont., N.D., S.D., Wis., Wyo. Heated front seats, memory driver seat and pedals, AM/FM radio w/in-dash 6-disc CD changer, steering-wheel radio and climate controls, universal garage-door opener. Transfer case skid plate, tubular side steps. Std. in Alaska, Minn., Mont., N.D., S.D., Wis., Wyo. Power rear quarter windows, trip computer. Std. XLS Limo, 4WD w/5.4-liter V8 engine. DVD player, fold-down color monitor, 2 wireless headphones. XLT requires Traveler Pkg. XLT, Eddie Bauer require AM/FM radio w/in-dash 6-disc CD changer. Telescoping heated power trailer mirrors w/turn signals, roof clearance lights, rear stabilizer bar. XLT requires Traveler Pkg. XLT, Eddie Bauer require AM/FM radio w/in-dash 6-disc CD changer.